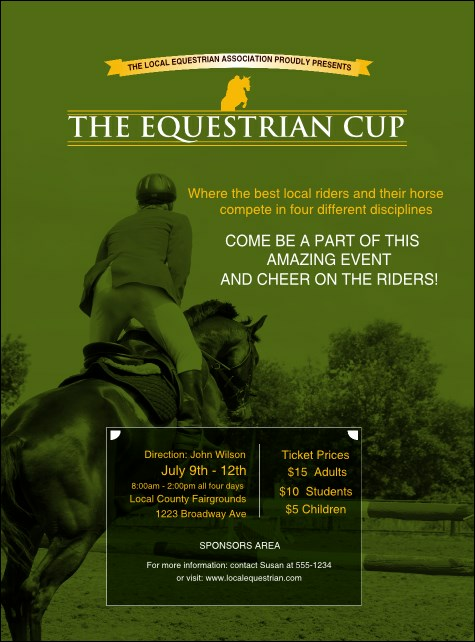 Impress enthusiastic horse riders when you use the Equestrian Flyer to publicize your function! An elegant steed vaulting with his refined rider in forest green grace this template with a cultured spirit that cannot be beat for any equine event. Nineteen bold lines await your every detail. Classic or contemporary, find the right flyer for every occasion at TicketPrinting.com!